Do you want to find gold in California? 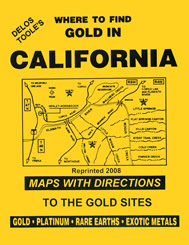 You'll have your work cut out for you with this handy book that is filled cover-to-cover with California gold maps and information. There are even directions to the gold sites! This book is an 8.5" x 11" paperback with 138 pages.